Adams & McNichol finished their work on the soldiers' monument last week Thursday. The base is of small stone, the work being done by O. C. Sawyer and helpers. 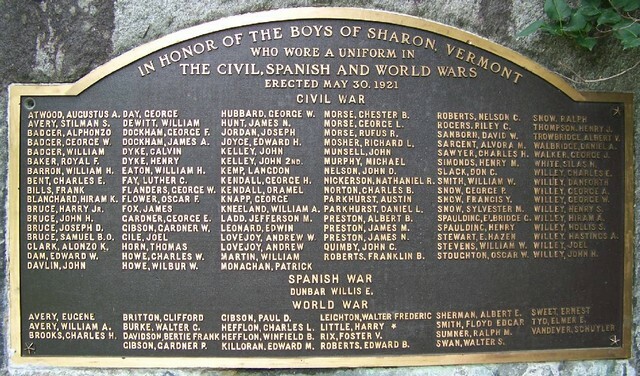 The tablet is of granite with a bronze plate, on which is lettered, "Tablet in honor of the Boys of Sharon, who Wore a Uniform in the Civil, Spanish and World Wars, Erected May 30, 1921." On it are also the names of 99 soldiers of the Civil war, one of the Spanish war, and 22 of the World war. It is a very good looking monument. There was a large gathering of people Memorial day. At 1:30 the usual ceremonies were performed at the cemetery. It being so warm, the exercises were held in the park. President Briggs from Straight college was present and gave an address. There were also four boys from the same place who sang several selections. Prof. Wood of Dartmouth gave the Memorial address. O. C. Sawyer presented the tablet and M. C. Noyes accepted it for the town. A. C. Hurd of White River Junction dedicated the tablet and Mrs. Grace Badger and Miss Jessie Patten unveiled the tablet. George Smith, a Strafford boy, who was in the Civil war, was present. Mr. Smith is about 99 years old and very smart, has no use for a cane, nor glasses, but is somewhat deaf. Source: photograph and unidentified scrapbook news clipping, with "1921 June 2nd" written in ink, courtesy of Charles Anderson.